John DeLorean was an experienced auto industry executive with time spent at Packard and General Motors where he was responsible for overseeing the introduction of the Pontiac GTO and Firebird muscle cars amongst other models in the GM range when he decided he could do it all better himself in 1973 and founded the DeLorean Motor Company with a vision to build a US$12,000 2 seat sports car. 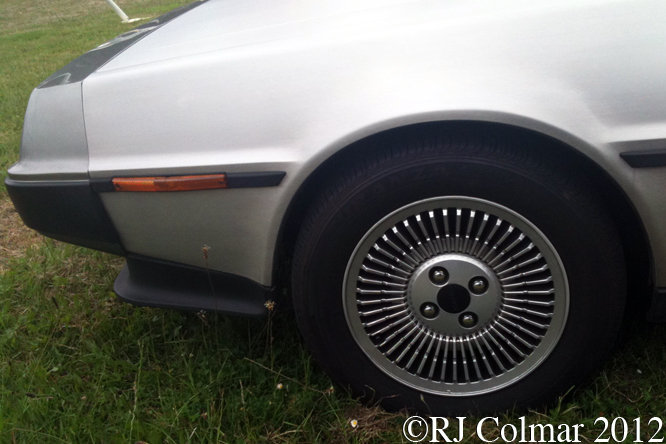 In 1976 the prototype DeLorean appeared with a body designed Giorgetto Giugiaro featuring gull wing doors and bare metal finish panels clothing a fibre glass body. A centrally mounted Citroen / NSU wankel motor mounted on a revolutionary Elastic Resevoir Moulded (ERM) chassis had been envisaged at this stage. As the dead line approached for manufacturing to begin it became apparent that neither the wankel motor or the ERM chassis was not up to job and Colin Chapman’s Lotus was given the task of re engineering the car which included using a steel back bone chassis and suspension similar to that used in the Lotus Esprit but with a Peugeot/Renault/Volvo aluminium block V6 (PRV V6) mounted behind the rear axle. 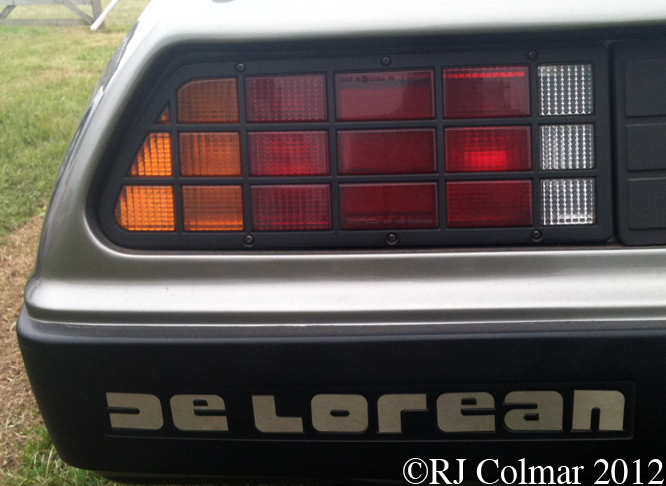 By 1981 DeLorean had secured $120m of funding to build a factory in the suburbs of Belfast, Northern Ireland and Renault had met it’s contractual obligations to build the facility. Quality issues had not been fully ironed out as production got underway in January 1981 with a largely inexperienced workforce earning premium wages. 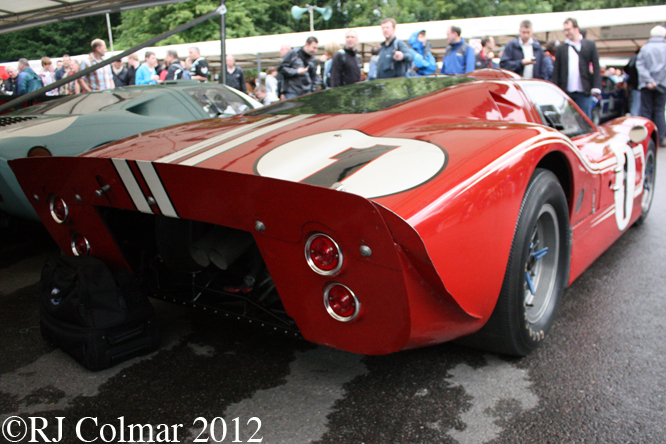 All DMC-12’s were built with left hand drive as standard, two batches of cars totaling less than 30 vehicles in all were converted by Wooler-Hodec Ltd to RHD specification, today’s featured car seen at last years Goodwood Festival of Speed is not one of them. 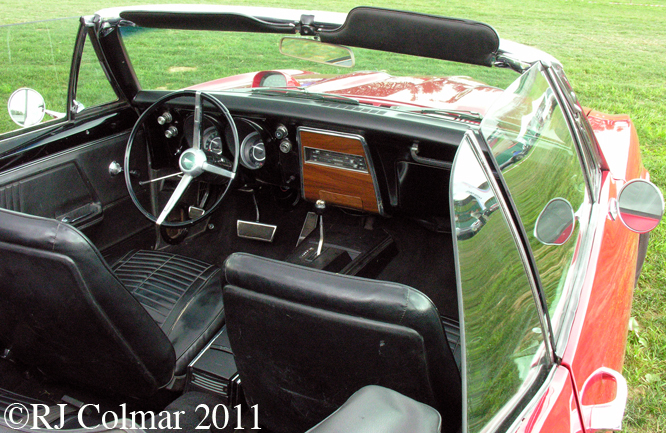 Clothed in SS304 brushed stainless steel panels which by design were nearly impossible to paint and repair, most damaged panels having to simply be replaced, the only options on the DMC-12 were manual or automatic transmission and black or grey interior. 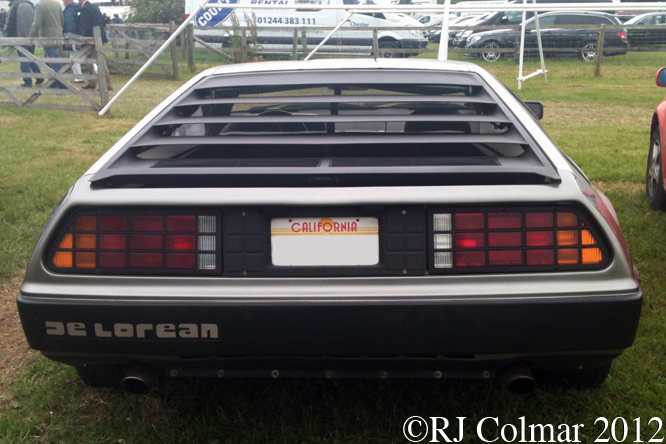 Although big enough to comfortably seat John DeLoreans 6′ 4″ frame the DMC-12 was not particularly well received by the press, it’s US spec 130hp failed to give the kind of performance expected from a car with a US$25,000 dollar sticker price. Road & Track recorded a 0-60moh time of 10.1 seconds with a US spec car while the European Spec DMC-12 with 150 hp managed a more respectable time of 8.8 seconds. 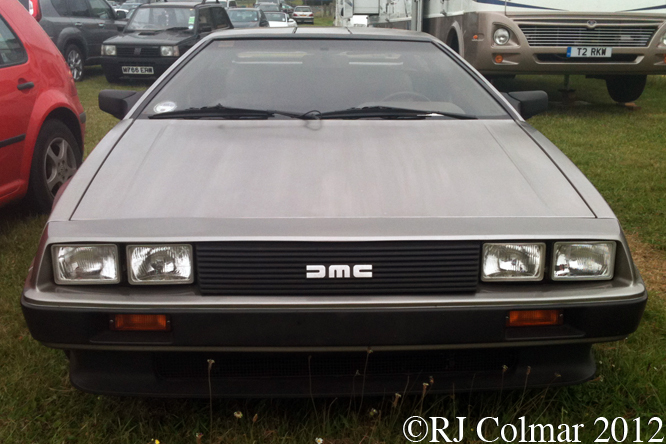 It is thought that 9000 DMC’s were built up until the end of production when the UK Government pulled the plug on the project, at the time US agencies appear to have been involved in entrapping John DeLorean into a drug deal as he attempted to find the funds to save his company. John was arrested but successfully defended himself with a government entrapment plea. 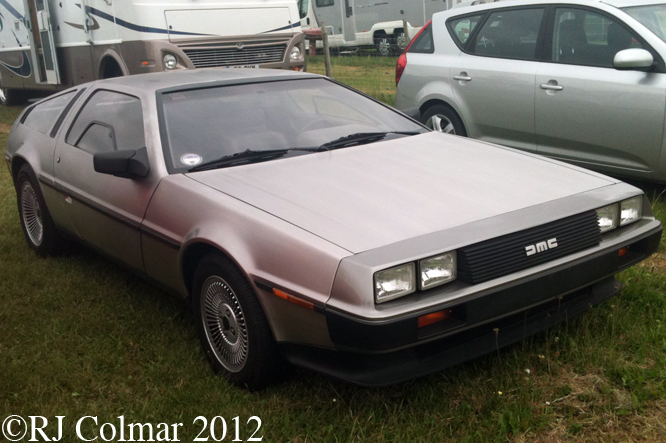 In 1985 a DMC-12 became the star in the first of the Back to the Future film Trilogy. In 2008 DMC-12 production restarted in Humble, Texas on a build to order basis using many original parts that were in stock when the original factory was closed. There are even plans for an electric DMC-12 to enter production this year. Thanks for joining me on this “Time Machine” edition of “Gettin’ a li’l psycho on tyres” I hope you will join me again tomorrow. Don’t forget to come back now ! 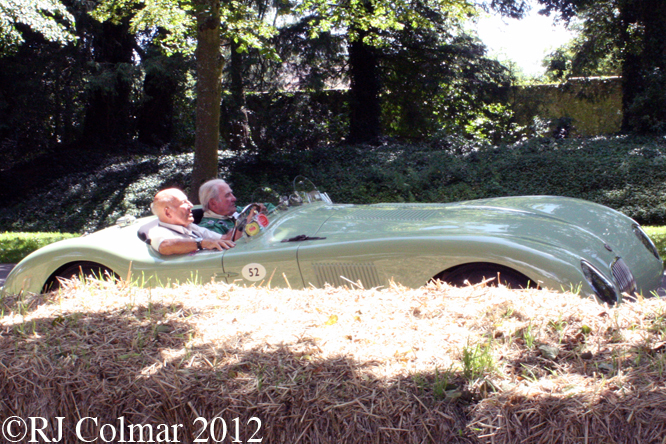 This entry was posted in Uncategorized and tagged Back to the Future, Chapman, Colmar, DeLorean, DMC-12, GALPOT, Giugiaro, Goodwood Festival of Speed, gull wing doors, John, Lotus, PRV V6, Ralph, Renault, Sports Car, SS304, Wankel, Wooler-Holdec on April 20, 2013 by Ralph. 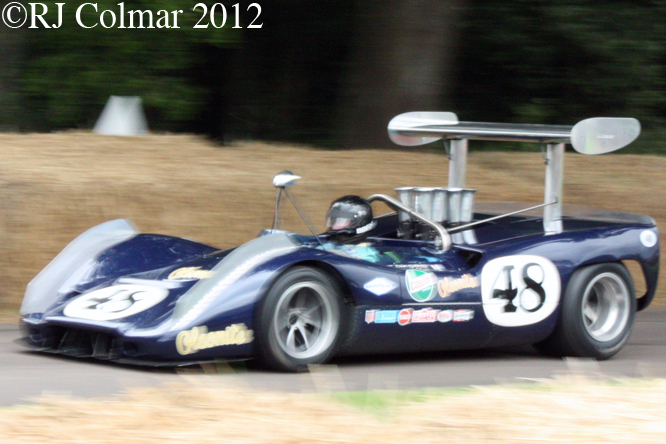 On Friday I headed off under grey skies with friends, Tim, Pete and Dave to Goodwood House just outside Chichester for the Festival Of Speed. The featured manufacturer this year was Lotus which was founded 60 years ago by Colin Chapman who’s cars not entirely uncoincidentally are currently also featured every Saturday here at GALPOT. 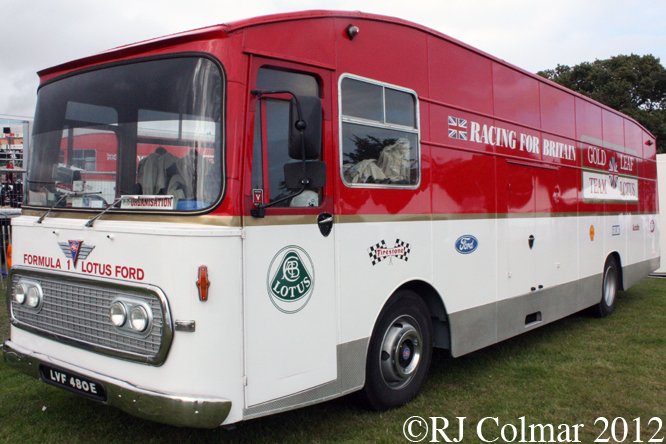 Welcoming us on the way into Goodwood House was this 1967 AEC Swift based transporter used by Gold Leaf Team Lotus from 1967 to 1970 during which period team won two world drivers championships with Graham Hill(’68) and Jochen Rindt (’70) and two world constructors in the same years. 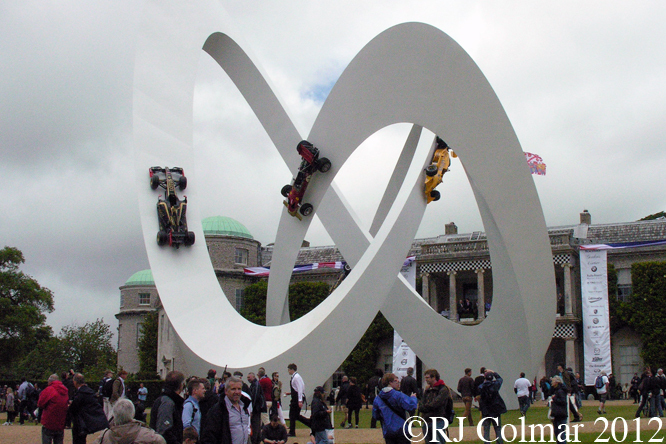 Gerry Judah’s art work on the lawn in front of Goodwood House featured no less than six cars five of them winners and a contemporary F1 car built in Enstone which I find as difficult to call a Lotus in the same way as I had trouble calling the Lotus 76 a John Player Special back in 1974. 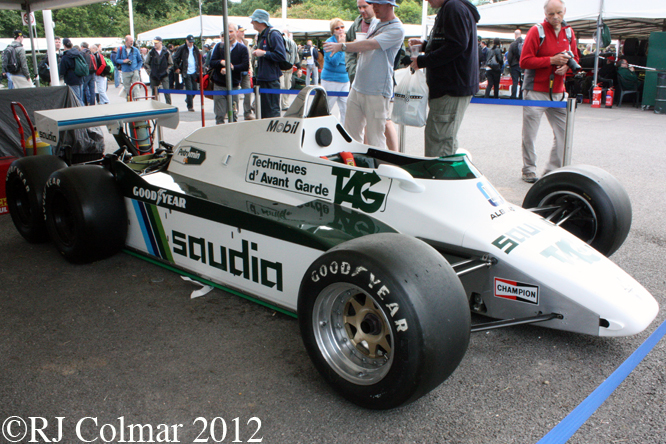 In the paddock there were several cars I had heard of but never seen in the flesh including the six wheel, 4WD, 1982 Williams FW08B which was never raced thanks to a late call to ban more than four wheels from Formula Once cars with only two to be driven from the start of the 1983 season. Of all the many stories of British grit in Grand Prix Racing perhaps none exemplifies how not to organise a team better than BRM which managed to organise the support in cash, kind and facilities from the British Motor Industry to make two of the most complex racing motors ever built. 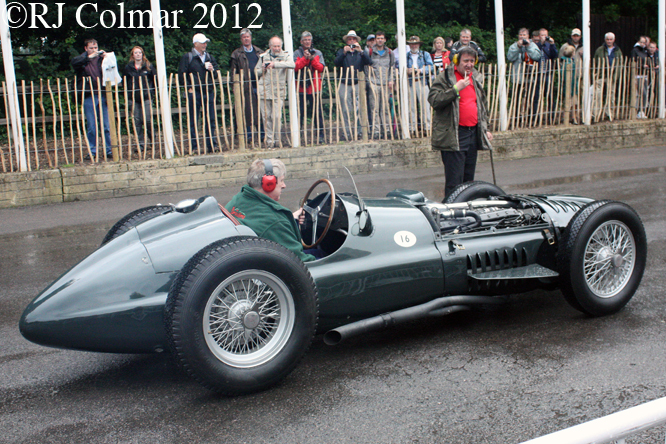 The first was a 1.5 litre / 91 cui supercharged V16 which comprised to 750 cc / 45.5 cui V8’s mounted back to back. The 500 hp motor, which could be taken up to 12,000 rpm, was more powerful than any of it’s contemporaries but the combination of organisational and design complexity did not result in a particularly reliable motor car. It did not win any championship Grand Prix, it was only entered in two but it did score championship points, and won a non championship 12 lap race at Goodwood. The most memorable thing about this vehicle is the sound it makes, utterly unmusical in comparison to a V8, and as harsh as granite, note two people in this photo are wearing ear defenders ! 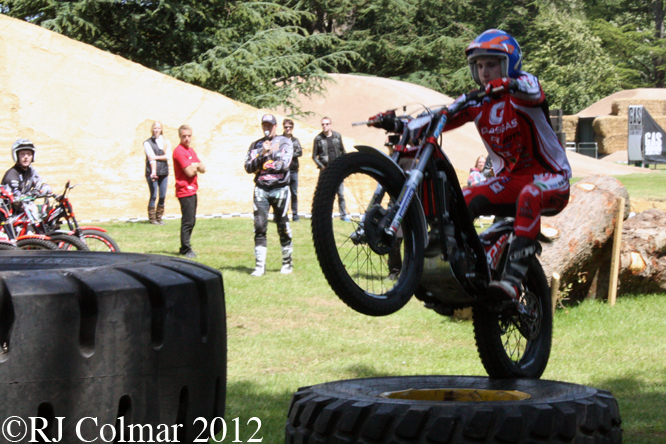 The smell of oil coming off it’s engine after the warming up session seen here was quite unforgetable too ! Amongst the sports cars this Maserati Tipo 151/3 is a 1980’s replica of one of three 151’s that were prepared for Le Mans in 1962 and then continually modified. 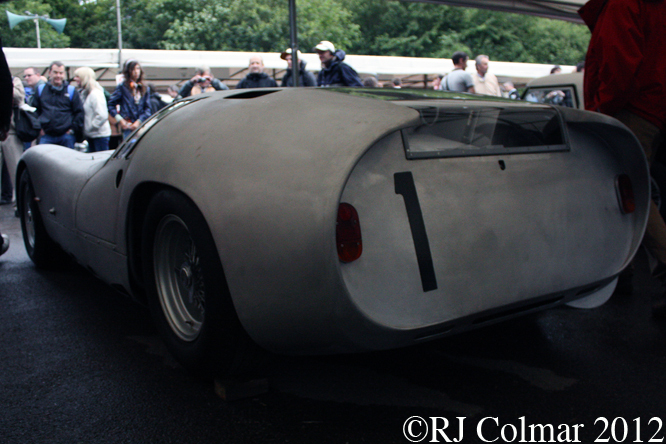 The 151/3 seen here made of from orginal parts and fitted with the low Pierre Drogo body made from the same buck as the body made specially for the 1964 24 Hours at Le Mans where 151/3 was timed at 196 mph on the Mulsanne Straight, like the BRM P15 it suffered poor reliability and retired as it has had in ’62 and ’63. 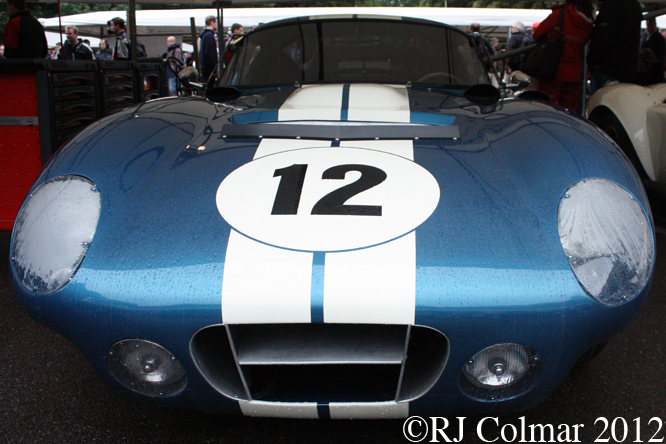 Racing successfully against the original 151/3 were the Shelby American Cobra Coupé’s also known as the ‘Daytona’ Coupé. So far as I can tell this #12 car is chassis CSX2300 which scored a best 6th place finish at Daytona in 1965 with Ed Leslie and Allen Grant at the wheel, the cars next appearance was at Sebring where it carried the #12 with Leslie and Grant again driving finishing 13th. Dan Gurney and AJ Foyt won the 1967 Le Mans 24 Hours driving this Ford Mk IV, beating two Ferrari P4’s in the process thus avenging Enzo Ferrari’s last minuet refusal to sell out to Ford earlier in the decade. 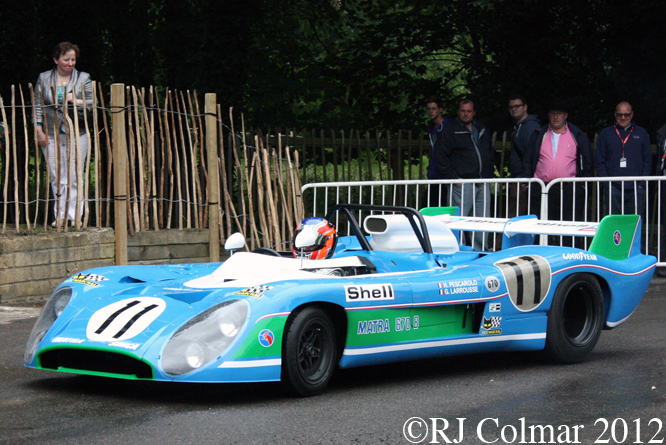 The Matra 670 B with a long tail, by Matra standards, won Le Mans in 1973 with Henri Pescarolo and Gerrard Larrousse at the wheel, also beating a Ferrari this time a 312PB driven by Art Mezario and Carlos Pacé. Above regular GALPOT contributor, through The Nostalgia Forum, Tony ‘Giraffe’ Gallagher happily accepts an invitation to sign 1980 IMSA Champion John Fitzpatrick’s programe. 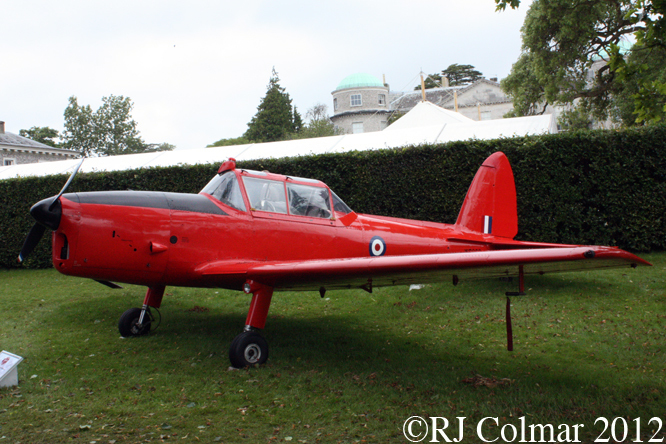 Continuing the Diamond Jubilee celebrations this years Concours d’Elegance centered on numerous vehicles the Queen and other state dignitary’s have used, this De Haviland of Canada DHG – 1 Chipmunk was used by both HRH Prince Phillip and HRH Prince Charles for training purposes in the 1950’s and 60’s. 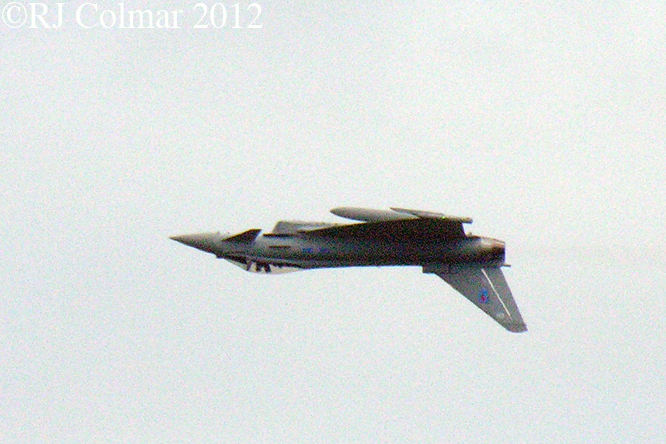 Back in the day when I was a schoolboy and an RAF Cadet I went up in one of these on a couple of occasions, being handed the controls mid flight on one of them ! 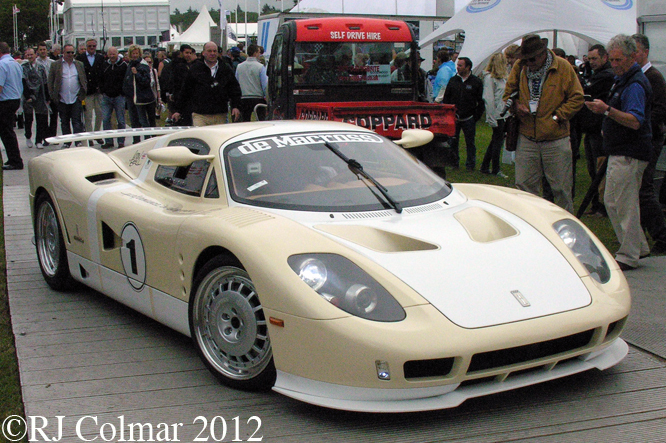 The De Macross GT1 appears to be constructed from a mix of Korean Finance, Canadian Manufacturing and US Roush Yates power and any number of styling queues taken from an equally diverse range of vehicles. 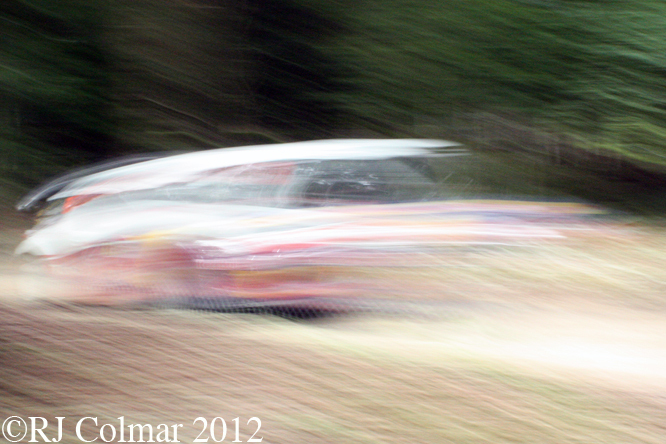 The drivers name on the side of the car was none other than that of motorsports TV presenter Justin Bell. Keeping folks entertained on two wheels were a number of youngsters who were doing things on motor bikes that I have only been able to aspire to dreaming of. 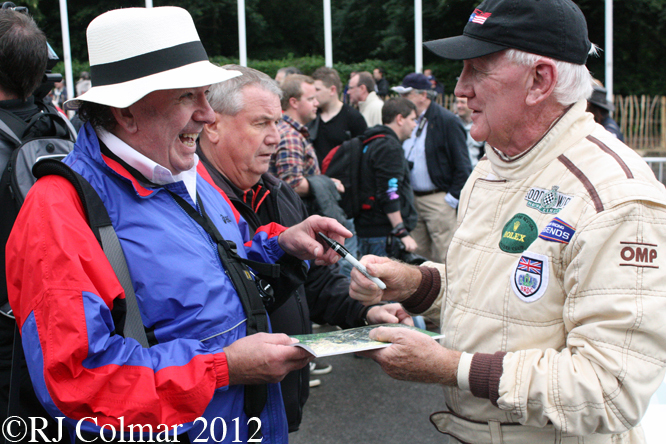 Sir Stirling Moss shares a little joke with former Jaguar works test driver and team mate Norman Dewis as they prepare for a quick blast up Goodwood’s hill climb. 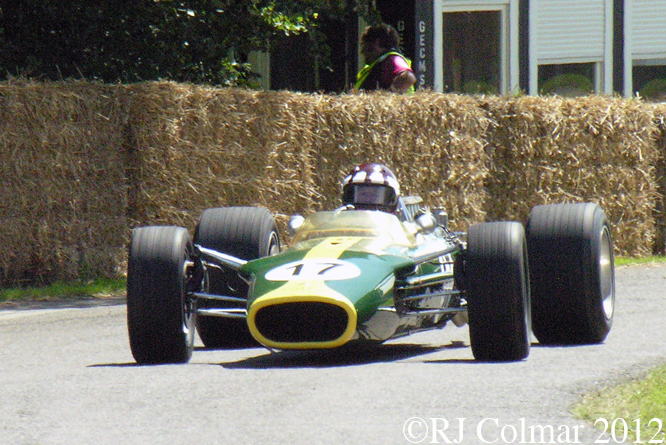 Jackie Oliver drove a Gold Leaf Team Lotus 49B in 1968 here he is seen driving the 1967 Lotus 49 chassis R2, later renamed R11, that Jim Clark used to win the 1967 Dutch Grand Prix the first of 155 Grand Prix victories for the Ford Corworth DFV engine that powered it and the first of 12 for the Lotus 49 type. Delivered nearly five years late and horrendously over budget the Eurofighter Typhoon made up for it with a simply stunning display of power, speed and maneuverability. With 40,000 lbs of thrust this plane can be flown like one of the better short nosed paper aeroplanes I used to make when I was a kid with the added bonus it does not crash when landing. Paul Knapfield’s Ferrari 712 chassis #1010 haa a long story to tell suffice to say here that in period it has underwent two body upgrades from it’s original 512S spec and an engine upgrade to make it the Ferrari with the largest Ferrari motor ever raced. 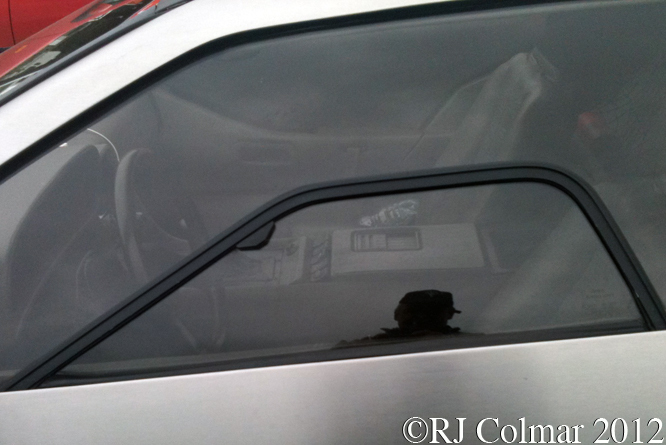 This car will be the subject of a blog in the fulness of time. Le Mans 24 hours will be remembered this year as the first ever to be won by a hybrid diesel, the #1 Audi R18 e-tron quattro of André Lotterer, Marcel Fässer and Benoit Tréluyer beat the the sister car of Allan McNish, Rinaldo Capello and Tom Kristensen, with a regular diesel coming in third. 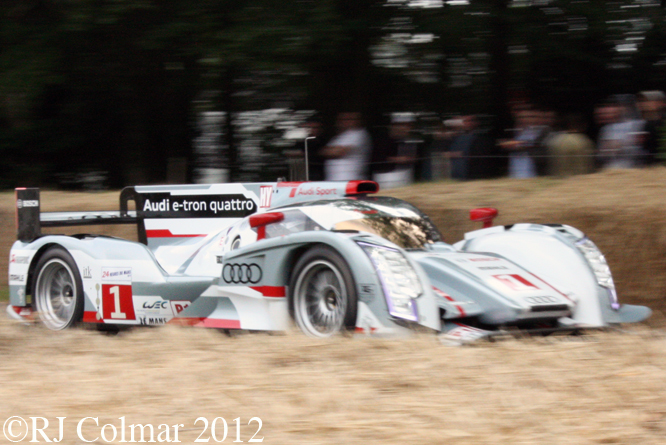 McNish is seen driving the e-tron quattro above which despite the stickers is not necessarily the car that crossed the line first at Le Mans. 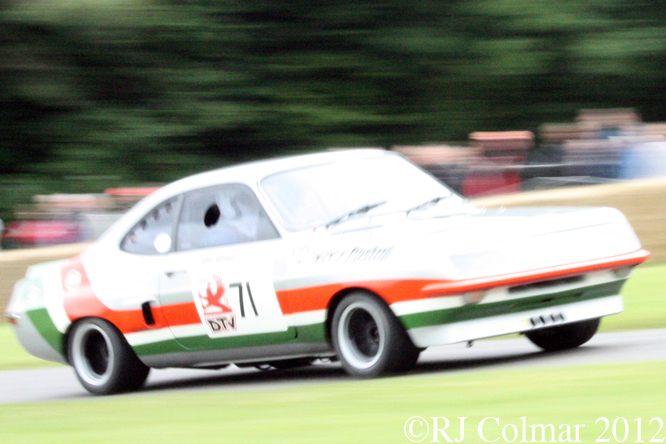 The ‘Droop Snoot’ Vauxhall Firenza “Old Nail” belonging to Paul Chase-Gardener scored over 60 victories with Gerry Marshall at the wheel back in the 1970’s Gerry’s son Gregor, another contributor to GALPOT through The Nostalgia Forum, was scheduled to drive this car later in the weekend. There were several Citroen DS3’s entered on the Goodwood Rally stage I believe this may have been the DS3 WRC example of Thierry Neuville, but I’ll happily take a second better informed opinion if you have one to add below. One of the pleasant rewards for taking the time to walk to the top of the hill was finding this Skoda Octavia vRS, a car that might not ordinarily bring the phrase ‘psycho on tyres’ to mind however this one had it’s turbo 2 litre / 122cui engine uprated from 200 hp to 500 hp and along with a few other safety mods achieved 227.080 mph at Bonneville to claim the 2 litre production car class record with Richard Meaden at the wheel last year. Four time World Drivers Champion Alain Prost was the honoured driver at Goodwood this year, though there were probably more vehicles present that were associated with Dan Gurney including the McLaren M6B, driven on this occasion by owner Andy Boone, which Dan modified so much it gained the ‘McLeagle’ sobriquet. Dan’s efforts were not enough to beat the Bruce and Denny show, Denny won the championship. Gurney’s best result with the car was a 4th place in the 1968 Can Am race at Riverside. 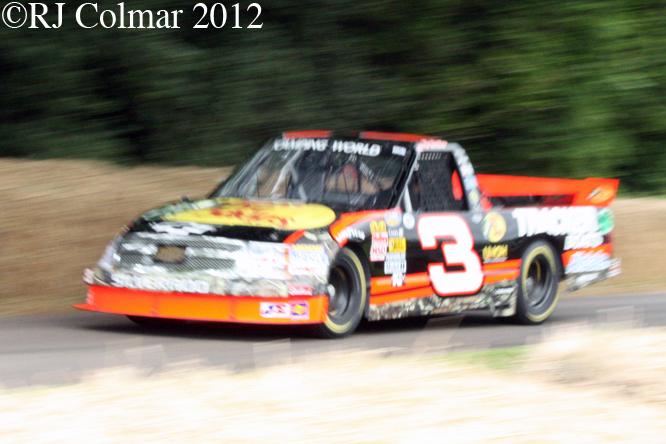 It’s always great to see and hear a little NASCAR action, Goodwood marked the first occasion on which I have seen a Camping World Truck Series (CWTS) truck in action, the #3 Chevrolet Silverado was driven by Austin Dillon to the Championship last season his brother Ty was scheduled to drive over weekend. 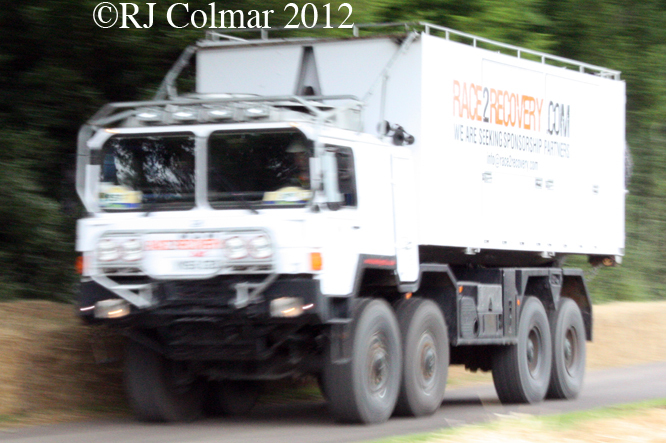 Largest vehicle on the track was the Race 2 Recovery MAN 8×8 Dakar support truck driven by Ben Gott. Race 2 Recovery plans to enter a team of Land Rovers in next years Dakar Rally all driven by injured soldiers. If you would like to help their cause you can find details on this Race2Recovery link. All too soon after a pleasurably exhausting day wondering around the grounds of Goodwood House without having seen everything it was time to say a quick hello to a couple of friends and then rejoin my passengers for the two hour back to the future drive home, my nomination for top car in the car park award went to the DeLorean DMC-12 which was substantially re-engineered by Lotus founder Colin Chapman, prior to the commencement of production in 1981. Thanks for joining me on this ‘Theme Lotus’ edition of “Gettin’ a li’l psycho on tyres” I hope you will join me again tomorrow. Don’t forget to come back now ! 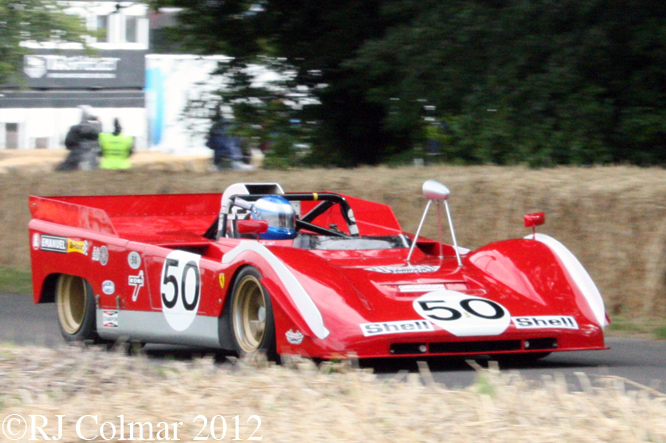 This entry was posted in Uncategorized and tagged AEC, American, Audi, BRM, Chevrolet, Citroen, Colmar, De Havilland, De Marcross, DeLorean, Eurofighter, Ferrari, Festival, Ford, Gallagher, GALPOT, Goodwood, Jaguar, Judah, Lotus, Man, maserati, Matra, McLaren, of, Ralph, Shelby, Skoda, Speed, Vauxhall, Williams on July 2, 2012 by Ralph. In 1954 vice president of engineering at General Motors Oliver K Kelly called Packards head of Research and Development John DeLorean to offer him a choice of jobs across the five divisions on General Motors. 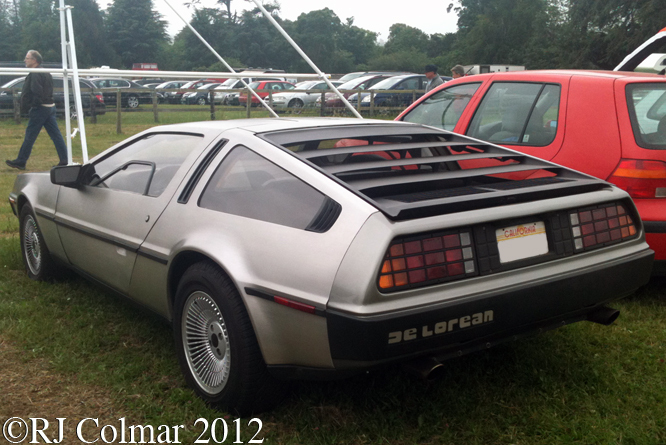 DeLorean who at the time also had the choice of moving to Studebaker with whom Packard had just merged settled on becoming assistant to chief engineer Elliot ‘Pete’ Estes at Pontiac. 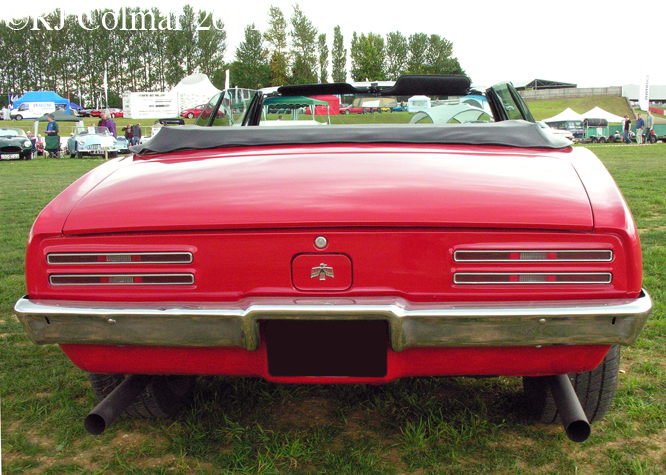 By 1963 John had become chief engineer at Pontiac, and Estes had become general Manager when they together with engine specialist Russell Gee and chassis engineer Bill Collins convinced the GM management to let them offer a $296 performance package on the Pontiac LeMans Coupé and Convertible body stiles that included a 325 hp 6.4 litre / 389 cui V8 motor normally found in the full size Pontiac Catalina and Bonneville models, from whence the ‘Wide Track’ strap line was born and named it GTO a name John picked up from the Ferrari 250 GTO. 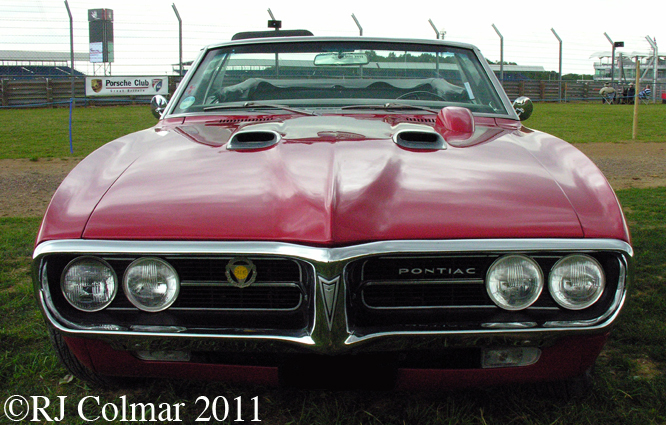 The Pontiac GTO with initial production limited to 5,000, by a disbelieving Pontiac Sales Manager Frank Bridge, was an instant hit with Ronnie and the Daytonas, the youth market at which it was aimed and GM Management. The GTO was responsible for transforming the image of the brand from an ‘aunties car’ to a youth orientated performance brand with over 32, 000 units built in 1964. 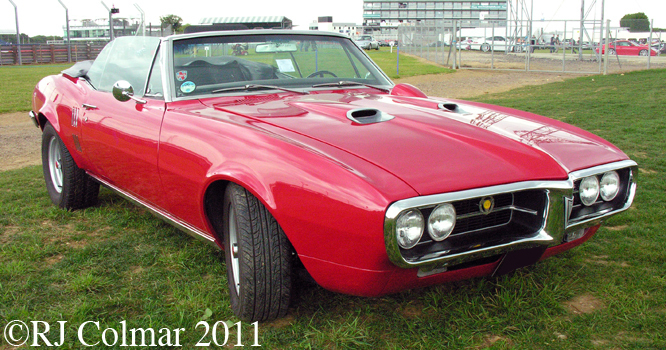 As the GTO was launched John DeLorean moved on to the development of the Pontiac Banshee a concept car to compete with the Chevrolet Corvette which was killed by GM’s top management. DeLorean seen as Pontiacs golden boy was promoted to head of the entire Pontiac division and given the consolation task of turning the Chevrolet Camaro into a Pontiac Pony Car with the proviso that there could be no alterations to the sheet metal except to the front and rear panels. 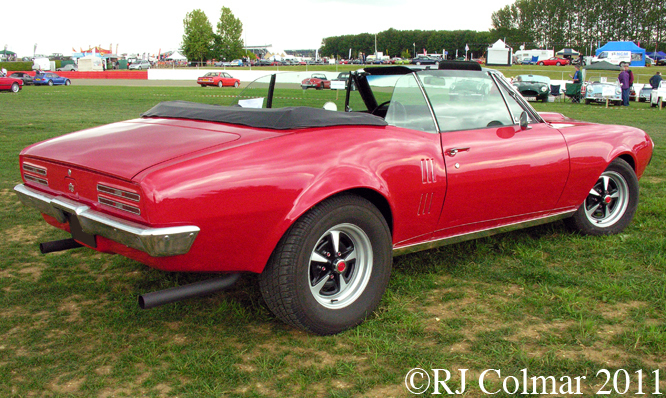 By incorporating a signature Pontiac split grill with built in bumper at the front and a version of the rear strip lights seen on the two Banshee concept cars the Pontiac Pony car was easily distinguishable from it’s Chevrolet sibling, Having failed to acquire the Banshee naming rights from rocket scientist Eugene F. Lally, who had successfully raced a Corvette powered special of the same name, for less than ¢50 per car, the name Firebird which had been previously used by GM on three seriously out landish gas turbine concept cars, was eventually adopted for the Pontiac pony car. 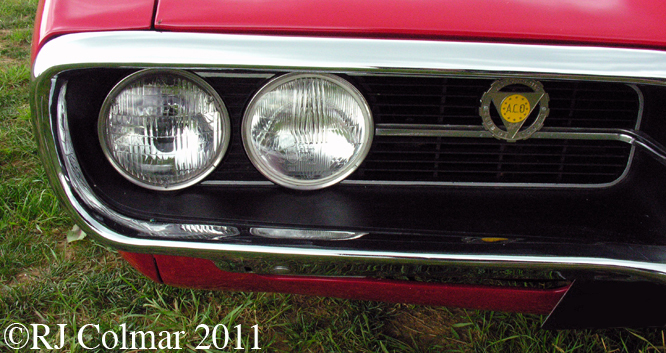 The absence of marker lights, Federally mandated in 1968, and the E suffix on the registration plate confirm this as most likely one of the five variations of the 1967 model line up. The Ram Air bonnet / hood suggests this car had the top of the range 6.6 litre / 400 cui motor installed when it left the factory. 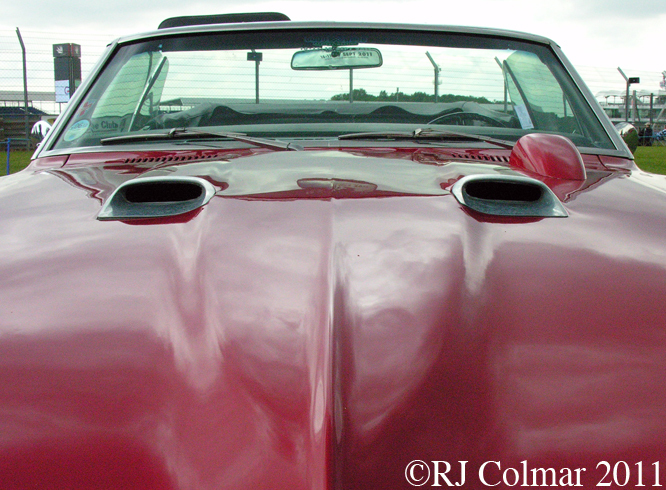 Just over 100,132 1967 Firebirds are thought to have been manufactured of which 9,980 were convertible. Thanks for joining me on this Wide Track Country edition of ‘Gettin’ a lil’ psycho on tyres’, I hope you will join me again tomorrow. Don’t forget to come back now ! 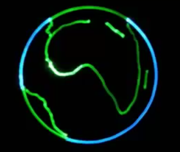 This entry was posted in Uncategorized and tagged Air, Art, Banshee, Car, Daytonas, DeLorean, Firebird, GALPOT, General, John, Motors, Packard, Pontiac, Pony, Ram, Ronnie, Tidesco on October 6, 2011 by Ralph.